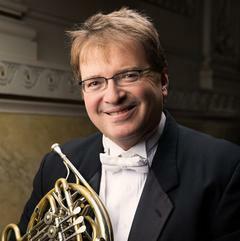 William Caballero has been Principal Horn of the Pittsburgh Symphony since 1989. Formerly, he held Principal and Co-Principal positions with the Houston Symphony and the Houston Grand Opera, and was Third Horn of the Montreal Symphony and the Montreal Opera, Acting Third Horn of the Boston Symphony Orchestra and the Boston Pops, and Principal Horn of the Hartford Symphony. Other performance activities have included the Philadelphia Orchestra, Los Angeles Philharmonic, Saint Louis Symphony Orchestra, and Aspen Music Festival. He is presently the Associate Teaching Professor of Horn at Carnegie Mellon University. Other teaching positions have included Adjunct Teacher of Horn at Rice University, Duquesne University, and Indiana University Bloomington. This is his ninth appearance at PMF since 2008.